Wireless systems for video transmission enjoy great popularity. Due to their small camera size, these systems are mostly inconspicuous but may endanger privacy, for example when a PIN number has to be entered. With the PKI 6040, you have a reliable jammer in hands which jams the frequencies used by wireless video transmission systems. Its compact design and built-in batteries provide operation at any time. The 1600 mA/h rechargeable batteries offer 1.5 hours of transmitting time. WLAN transmission is reliably stopped at a frequency of 2.4 GHz so that you are protected against digital video transmission. The power output of each frequency range is 300 mW and is therefore 30 times higher than common video transmitters at 2.4 GHz. Hereby, a radius of up to 15 m is covered. The antennas are detachable and can be replaced by directional antennas. 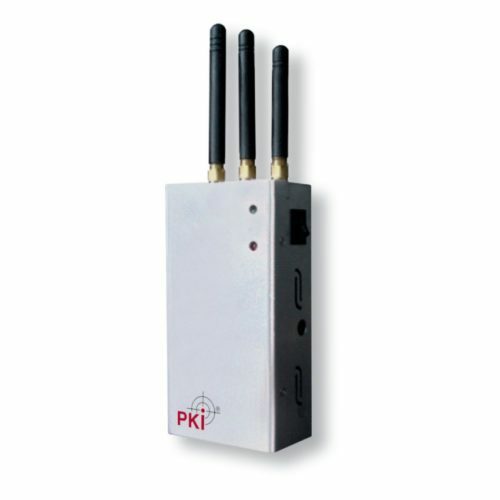 As a result of its compact dimensions and weight of 300 grams, the PKI 6040 fits in every pocket.